AMMONNEWS - The Jordanian and the South Korean governments on Thursday signed a scientific and cultural exchange program for the years 2018-2020 in the fields of education, higher education, culture, tourism, archeology, media, youth and sports. 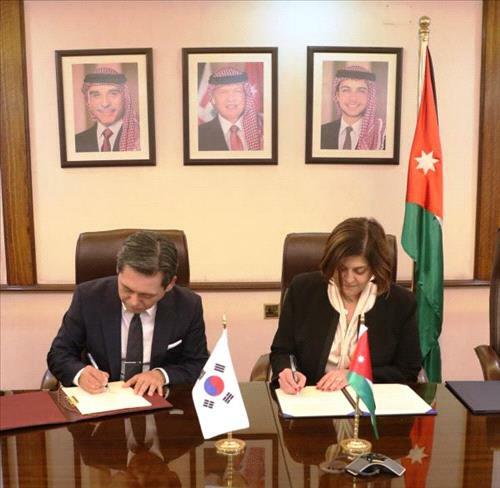 The joint program was signed by Minister of Planning and International Cooperation, Mary Kawar, and S. Korean Ambassador to Jordan Lee Boom-yun. According to the Ministry of Planning, Kawar said the program comes within the framework of Jordan's efforts to promote and develop bilateral cooperation relations with the S. Korean side in a range of areas of common interest. During the signing ceremony, the minister said the program will develop the bilateral ties, especially as it includes several executive measures in several fields such as education, higher education, culture, tourism, archeology, media, youth and sports. The program includes the exchange of scholarships, visits of experts and educational delegations, participation in training seminars and technical teams, as well as boosting cooperation between news agencies and radio and television institutions in both countries. The implementation of the program, the tenth of its kind signed with the S. Korean side, will be carried out by the relevant institutions in both countries, Kawar pointed out. Kawar expressed the government's appreciation for the S.Korean continued support to the Kingdom, and praised the distinguished bilateral relations, which are witnessing continuous development in the various fields. For his part, the S. Korean envoy described the program as an additional and important step on the way to enhance cooperation relations between the two countries. In the same context, the ambassador reiterated his country's commitment to continue to provide various support programs to Jordan in various fields of mutual interest and to contribute to the development of bilateral ties.